An Electric Truck With Tough Off-Road Capabilities? 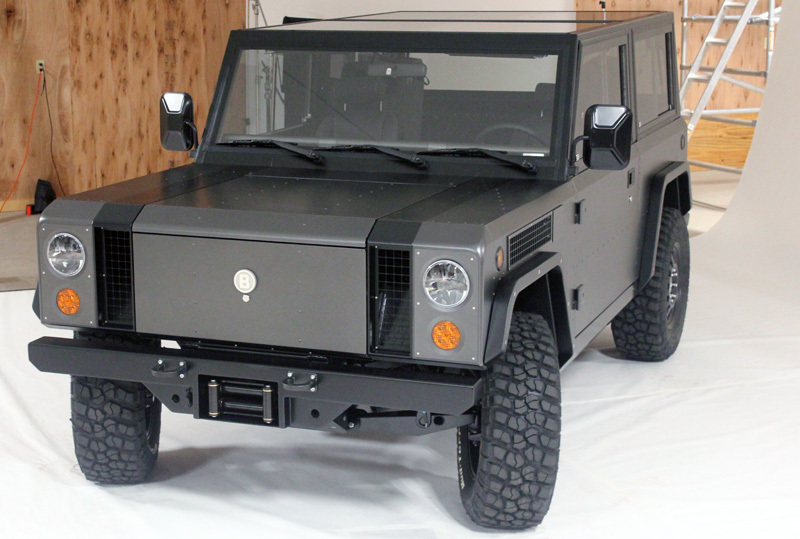 Bollinger Motors Unveils Prototype. There are electric cars and electric SUVs but so far no electric truck for the consumer, certainly nothing that can go toe-to-toe with the fiercest work trucks or ruggedest rock crawlers from mainstream auto makers. Bollinger Motors hopes to change that. The company this afternoon unveiled the prototype for an all-electric, all-aluminum, all-wheel drive monster it hopes to get into production by 2019 and into the market for somewhere in the mid five-figures – before incentives. Although its boxy design – some might call it rugged – won’t please everyone, the B1’s pre-production performance stats are impressive and include: 360 hp., up to 20.5-inches of ground clearance, 6,100-pound payload, 120 miles of range and the flexibility to switch from open pickup to closed SUV with relatively little effort. TheGreenCarGuy had the opportunity to visit Bollinger’s shop in upstate New York before the unveiling to prepare an article for Trucks.com, a major trucking industry and truck enthusiast site. You can check it out – and get all the specifications for the Bollinger B1 – by clicking here to jump to the Trucks.com piece.